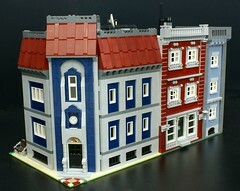 Brick Town Talk: Matijaville - LEGO Town, Architecture, Building Tips, Inspiration Ideas, and more! Architectural genius Matija Grguric brings us this elegant train station and other town buildings in grand detail. Down to a shopping center and up to a skyscraper, everything's there. This is a true inspiration for anyone wanting to build something, so take heed and look through these magnificent creations. The incredible train station. Well positioned with a very imposing style. Color variation is just excellent. Dark blue, dark red, light blue, light gray — it's all there. ...and then there's that awesome Honda billboard (closer image here). I really like how these two buildings just work together. The contrast is perfect. 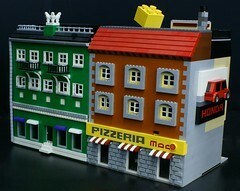 Check out the whole town display over at Matija's Flickr photostream!